It’s that time of year again. Your seniors are graduating and in a few short months they will leave your student ministry to start a new chapter of their life called college. If your like most student pastors during this season, your searching online for that perfect graduation gift to give your seniors. Even though it’s been done since Adam and Eve graduated high school, I think giving your seniors a new Bible is the way to go. But if we want them to appreciate the Bible and actually use it, you need to invest in getting them a good Bible. Let me suggest a few of the Bibles I would consider giving your graduating seniors. 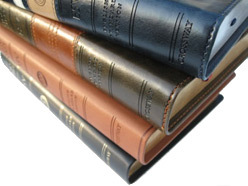 ESV Thinline Bibles. If you have a lot of seniors and a tight budget this may be the Bible to go with. Usually the ESV thinline Bibles are pretty cheap ($20-$30) and are very popular. Their simple Bibles that are easier to carry around or throw into your book bag. You can get this Bible in many different colors, materials, and designs. ESV Study Bible. This is the Bible of choice if you want to give your students the best! This is what we will be doing for the next few years. The ESV Study Bible is by far the best study Bible out there right now. It’s a pretty large Bible, but is packed with study notes, book introductions, maps, charts, and other resources. This is a Bible your seniors will not only find helpful in college, but for the rest of their life’s. The only bad thing is the price. This Bible is not very cheap, but if you dig around online long enough you cab find a good deal on this Bible. Apologetics Study Bible (HCSB). I haven’t used this study Bible much myself, but I have heard some great stuff about it. The notes and resources includes within the Bible deal with apologetics and answering common questions in regards to defending Christianity. Since many students head off to secular universities where professors will discredit Christianity, this Bible could be a great tool for them during those college years. Check this Bible out and see if it may be a good fit for your students, especially those headed to secular colleges and universities. College Devotional Bible (NIV). This is another Bible I have not looked into much yet, but it seems to make a great gift for graduating seniors. One of the most important things a college student can do is get into a regular habit of spending time in God’s Word everyday. This Bible is designed for college students who are busy and need a plan in place to read Scripture. It includes a reading plan that goes through the college year. These are just a few of the Bible out there that will make great gifts for your graduating seniors. You may notice that many of these Bibles, especially the ESV Study Bible and Apologetics Study Bible, have popular students versions of them. I didn’t share those because I think college aged-students have outgrown the “student Bible” days. Those are great for middle and high school students, but not for college students.